DaDaFest Leaflet published by DaDaFest. This audio description has been compiled by Trish Wheatley in February 2018. It was commissioned by Disability Arts Online on behalf of NDACA (the National Disability Arts Collection and Archive). It is approximately 7 minutes 20 seconds long. 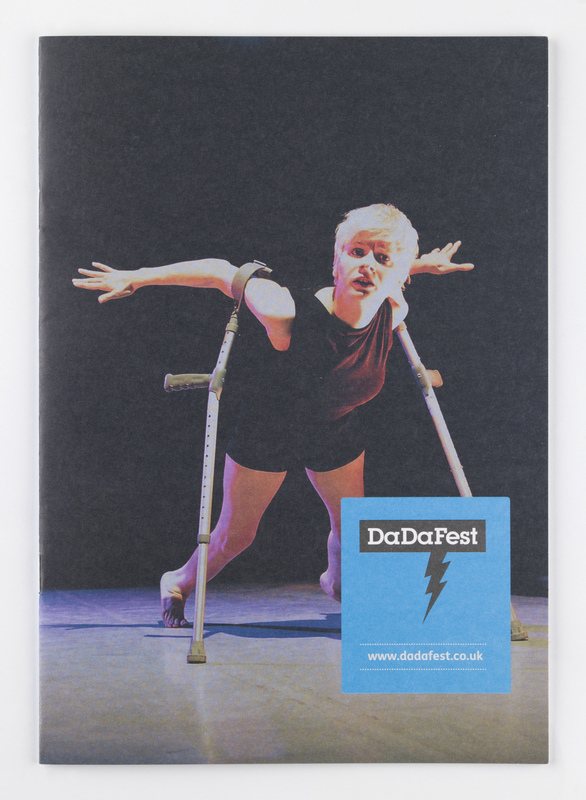 The DaDaFest leaflet is a 24-page stapled A5 promotional document printed on matte paper. It contains a history of the festival, plus a roundup of DaDaFest’s activity in 2012. The front cover shows a photograph of Claire Cunningham performing at DaDaFest International 2008. Cunningham is a performer and creator of multi-disciplinary performance who makes work that explores the use or misuse of crutches. The photograph shows a sparse grey stage, fading to a black background. Cunningham who is in her 20s is captured mid-performance on bare tiptoes, leaning forward against the crutches that are buckled around the top of her arms and positioned in front of her to create four points of contact with the ground, balancing her. Her arms stretch out behind her with fingers spread. Cunningham is dressed in short black shorts and black wide-strapped vest top. She looks out just beyond the camera with a quizzical expression, frowning, but with eyes wide open and mouth slightly open. Her short pale blonde hair is swept to the left across her forehead, framing her face. She is lit from the right by strong off-white stage lighting, with a soft magenta and blue glow coming from the left. The DaDaFest logo and website address sit on a bright blue rectangle, overlaying the photograph. It is hiding Cunningham’s lower leg and crutch on the right hand side of the leaflet front cover. The DaDaFest logo features the name of the organisation in white writing on a black rectangle with black lightning strike zigzagging down just off centre. Inside, although not visible in this image, the leaflet contains sections including: an Introduction from Jane Cordell, About DaDaFest, Young DaDa, Research Networks, Festival Timeline, Our Audience, Support Us and Partners. The leaflet tells us that DaDaFest is “an innovative disability arts organisation based in Liverpool, working throughout the North West, the UK and internationally”. Originally formed in 1984 as Arts Integrated Merseyside, then becoming the North West Disability Arts Forum in 1990, it was one of the first arts organisation controlled by disabled people that campaigned for equality and access for disabled people in the arts. The festival was established to platform disabled artists and support them becoming heard and included in the wider arts sector. The first event was held in 2001 and repeated annually until 2010 when it switched to the biennial format, largely for practical reasons to enable the organisation to fundraise and develop its most ambitious programme in 2012. This year saw the culmination of the Cultural Olympiad, a four-year programme of arts and cultural activity leading up to, and during, the London Olympic and Paralympic Games. It was a hugely significant year for the arts, with many festivals, and one-off events celebrating the quality and breadth of the UK’s artistic output and international collaboration. DaDaFest was no exception, putting on an ambitious programme of visual and performing arts. The festival included a visual arts exhibition called Niet Normaal: Difference on Display at the Bluecoat in Liverpool from Friday 13 July to Sunday 2 September. This exhibition was originally curated by Ine Gevers at the Beurs van Berlage, Amsterdam in 2010 and was adapted by Gevers and Garry Robson for DaDaFest. The exhibition focused on a “definitive question of our time: what is normal and who decides?” DaDaFest International 2012 featured 160 artists from 17 different countries including a performance at the Liverpool Philharmonic Hall by internationally renowned percussionist Dame Evelyn Glennie. It also included a wide programme of talks, events and workshops, engaging with almost 105,000 people across venues in Liverpool. Although Claire Cunningham didn’t perform at the 2012 DaDaFest, the story of her involvement with DaDaFest is an excellent example of DaDaFest achieving its mission. At the 2016 DaDaFest Congress Claire spoke passionately about how DaDaFest changed her life as a performer, which ultimately led to her international career. “like many artists her journey to embracing disability arts happened over a period of time. New to the social model and new to the language of disability arts, she responded negatively to descriptive terms like ‘crip-culture’. She was clear that she didn’t want to make work that reinforced ableist attitudes, but equally felt that making work with the political intention of challenging attitudes would fail.